As the minister expounded on this passage, he shared how there are times when he and his wife are not getting along. Each time that they argue or have a disagreement, he wants to point the finger at his wife, but God has him to look at himself. When he takes time to look at himself, he sees something that God wants him to do that will bless his wife. He challenged all of the husbands to apply this verse to their marriage by “washing your wife with the word.” In his experience, washing his wife with the Word of God has blessed his wife and has therefore, blessed him. He said, sometimes you wonder why your wife is not treating you right or why she is not acting right and here is the question, “Have you been washing her with the word?” When a husband learns to wash his wife with the Word, he will take time out of his day, every day to pray with his wife and read God’s Word to her. God has given husbands the key in Ephesians 5:25 & 26, but husbands must discipline themselves to use the key. Please note that this is not something that is done in anger or done to bring correction to a wife. This must be done with the right tone, mood and it must be done in love. When a husband lovingly, prays and washes his wife with the word, he blesses her, and she will bless him. Some years ago, my husband made the commitment to pray with me every day. It has been the glue that holds our marriage and our family together. “A family that prays together, stays together.” However, after hearing the testimony of the minister and embracing the challenge, my husband decided to take things to another level by washing me with the Word of God. So for the past few weeks he has been praying and reading scripture to me. You see, he thought, because I read the word myself, he didn’t need to read it to me. Oh but I am here to tell you, there is something special about a husband reading the scriptures to his wife. The Word of God is powerful! I am sharing this because its good, and it has blessed me in such a way that I hope others will be blessed. It’s funny how something that only takes 2-3 minutes a day can be so powerful and effective. It blesses me every day! Being washed with the word helps my stinking thinking, blesses my attitude, helps me to feel loved and makes me want to love my husband more. 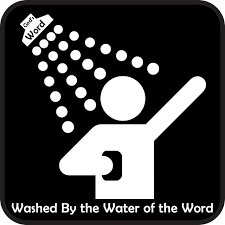 I am witness that washing your wife with the Word of the God is a winner! Calling ALL husbands who love their wives and care enough to want to see them grow, glow and go to another level to read and apply Ephesians 5:25 and 26 EVERY day! p.s. I can hear the voice of the ladies who say, I wish my husband would do this. Put this on your prayer list and allow God to put it in your husband’s heart. Be encouraged, because God is able! Oh, how I love this! I will definitely add this to my “honey please” list. My husband is working overseas for the next two and a half months and while we do pray with one another twice a day, as you recommended in the Homebuilders’ class, being washed in the Word will definitely help me through this challenging time. Thank you so much for sharing! I am sure it will be a blessing to me as well!